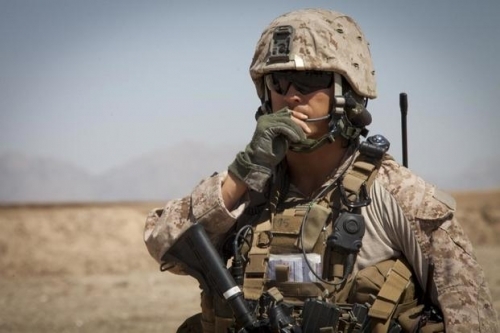 A new request for information issued by the Marine Corps seeks devices that can fit inside or around the ear of an infantry Marine to hear important battlefield sounds and commands -- even while protecting his or her ears from sound damage. "Marines have the earplugs and they do provide protection, but sometimes they choose not to wear them because they want to be aware of their surroundings at all times," Steven Fontenot, project officer for Hearing, Eye Protection and Loadbearing Equipment at Marine Corps Systems Command, said. "The new headset we want to acquire will allow Marines to wear hearing protection, yet still provide the opportunity to communicate and understand what is going on around them." Systems Command has already begun testing headsets designed to enhance hearing. In a February test, 220 Marines from the infantry, artillery, reconnaissance and combat engineer communities were asked how a sample headset worked, how easy it was to use, and how comfortable it was. "Marines wore the headsets throughout their regular training cycle to assess comfort and how well they integrated with the ECH," Fontenot said. "We want to make sure the headset we acquire is rugged and capable of operating in a wide range of environments a Marine might encounter, from cold weather to extreme heat." Officials want a headset system robust enough to protect against hearing loss from battlefield weapons systems that don't even exist yet, but could pose even greater hearing risks when they become operational. "It is likely we will field a suite of hearing systems, and Marines will get what they need based on their specific role and unit," Nick Pierce, Individual Armor Team lead, said. "The ultimate goal is to field a hearing system that will help Marines communicate better and increase their lethality on the battlefield."